Going to Chicago or Washington D.C. for a conference? Maybe taking a vacation abroad? Whether it’s for business or pleasure, you can save money through your ADA membership on hotels, car rental and flights. Loews Madison Hotel in Washington, D.C. 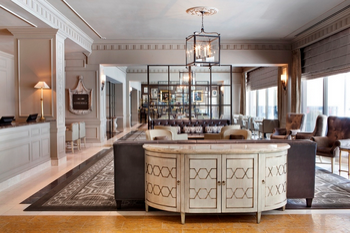 If you’re coming to Chicago for a conference at ADA Headquarters or just visiting the Windy City, members can save significantly at various participating Chicago hotels: Four Seasons Chicago; Hilton Suites; Hyatt Chicago Magnificent Mile; Loews Chicago Hotel; Ritz-Carlton; W Chicago Lakeshore; Westin Michigan Avenue. Members can reserve for themselves or make reservations for friends, family or staff. In Washington, D.C., you can request the American Dental Association preferred rate at Loews Madison Hotel, a luxury hotel located near various monuments and museums. Going abroad? ADA members can save 10 percent off the Hyatt daily rate at participating Hyatt Hotels & Resorts — including Hyatt, Hyatt Regency, Park Hyatt, Grand Hyatt, Andaz, Hyatt House and Hyatt Place — worldwide. For additional information on the Hyatt member benefit program, click here. Those who need a car when traveling, ADA members get preferred rates from rent-a-car services such as Alamo, Enterprise and National. For more information, including full descriptions of the benefit program, click here. Lastly, if you’re traveling for a qualified ADA-sponsored meeting, you can save money with Gant Travel and United Airlines. For more information on the various travel benefits ADA members receive, click here.